What a crazy last couple of days! I'm pretty sure that I'm coming down with a cold. All signs point in that direction. At least it's waited until the taper part of training. Yes, that's right it's Taper Time!! Yesterday I only had to run 8 miles =). Now those 8 miles were actually done with my mentee who was running 20 miles yesterday (Go Angela! ), which meant I was running miles 12-20 of her route. That also meant I had to find something to do with myself for a couple of hours until she got to where I was waiting. No big deal. I got to chat with one of our awesome GTS coordinators Amy, and cheer in my teammates who were just running a normal 8 miles, and then off Coach Jo and I went to cheer in our teammates at the 12 mile water stop. 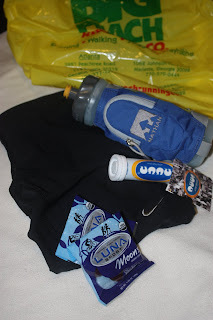 I got some Luna moons (blueberry is my favorite), Nike running Capri (really excited about these), citrus fruit Nuun, which also comes individually wrapped so I can carry an extra with me on race day, and a new Nathan's sport bottle. I got even more excited and went home to start planning everything I need to pack. Monday is our Coach's Countdown Meeting, which sadly I can't go to because I'm not done for the until until 8:30pm. So, I'm going into the office to get my apparel, flight info, schedule, and other tidbits of helpful information. I've got a couple of other things I'm trying to sort out this weekend. One is finally registering a domain name for my violin studio's website. The other has been figuring out what to do with my iPhone. The screen cracked yesterday =(. A super nice employee at the Apple Store helped me come up with a temporary fix because I can't afford to get the screen fixed or just buy a new one. Hopefully this will work for now. Fingers crossed!! !